With today’s digital cameras using more and more power it is always a good idea to bring an additional battery. That is where the Think Tank CF/SD + Battery Wallet can save the day. Having the right tool for the job can make or break the envisioned photo shoot or just about any project. People rarely credit the camera bag as a photographic tool. Sometimes you want the camera and only one lens. I find that it is best to bring only those things that you will need. Bringing a lot of extra equipment, just because it was in the case, will slow you down. Back in the heyday of the 35mm SLR many of the camera straps came with elastic loops to hold extra cans of film. A bandolier of film, making you look like a bandito from a spaghetti western. Can you imagine, getting only 24 or 36 exposures on a roll of film? How was it possible to take a good photograph without Spray and Pray? A case in point; the other day I was in my studio* taking product shots for a client as well as photos for this article. In the middle of the shoot my battery took an unexpected vacation. But wait, the cavalry was already on the scene. The Think Tank CF/SD + Battery Wallet had my extra battery right there. I was back up and running in one minute or less. Likewise it is a good idea to bring an extra memory card along. 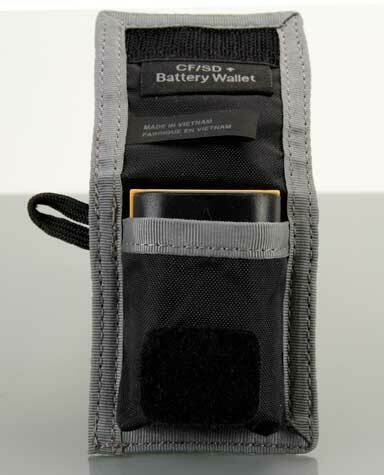 The Think Tank Wallet can hold one battery and one Compact Flash storage card or up to three Secure Digital cards safe from dirt dust and moisture. Of course, if you need three additional SD cards you will probably need more than one extra battery. The fit and finish is excellent and tight, almost to a fault. The pockets are so tight that getting the battery and cards in and out can be more time consuming than desired when the sun is setting or the client is looking over your shoulder. It is likely that this concern will lessen with age and usage. 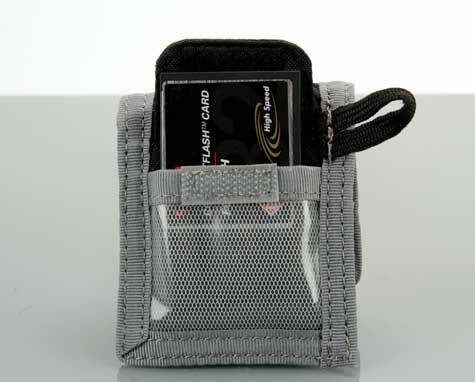 There is a little loop that allows the wallet to be secured to something. 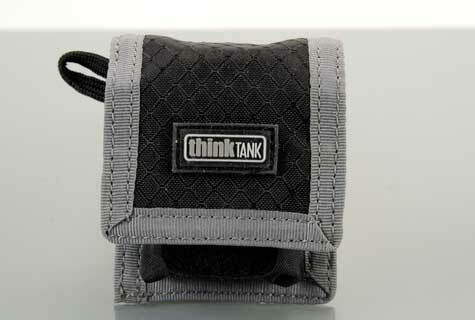 My suggestion is that Think Tank should think about including a small carabiner to aid in hanging the wallet from a belt loop or some other convenient point to keep it out of your way but ready for use. *Please note that studio is a euphemism for an extra garage without heating, ventilation, or air conditioning.